The latest Dungeon Crawl Classics adventure from Goodman Games packs an incredible amount of memorable adventure in its 24 pages. It is pretty much impossible to provide a substantive review without providing some serious spoilers, so if you plan on playing in this adventure do not read on. Just us Judges? Good. #93 Moon-Slaves of the Cannibal Kingdom is similar in scope and structure to Harley Stroh’s #78 Fate’s Fell Hand. Rather than a battle between three wizards on a demi-plane of phlogiston, the PCs will discover three sisters on the Tolomak islands, each with their own motivations, minions, and powerful allies. This works very much like a jungle-island sandbox/hex-crawl that allows the PCs to discover various locations and factions and react to them however they would like. The beginning of the adventure suggests you could run this in a 4-hour convention slot, but I don’t see how you would do more than scratch the surface of the materials provided in that time frame. This could easily be a mini-campaign in its own right, stretching several gaming sessions. If you’re looking for bang for your adventuring buck, look no further. However, I would not recommend this for novice Judges, or those with only a bit of time to prepare. This is one for experienced Judges who can manage a lot of variables at the same time, and roll with whatever the players are going to throw at them. For instance, there are three moons that shine down on the islands – blue, green and red. Depending on what day it is, key NPCs will be in different locations, the moon-bird will have different powers, the contents of the fountain of liquid moonlight will have different effects and a portal will appear in one of 7 locations. Each sister has motivation, quirks, initial and later attitudes, minions and allies. One of those allies is the 20′ tall ape on the cover of the adventure (one of my favorite single-panel Kovacs covers in awhile!) who has his own motivations. Luckily these details are organized at the beginning of the adventure in brief rundowns of the key NPCs and a chart for the cycles of the moon. By the way, the ship that brought the PCs here is about to mutiny, so they may be stranded on these volcanic jungle islands if they don’t get back soon. Also, if the PCs manage to destroy the apparatus keeping the entire volcano in check, it could be a very dramatic TPK. All of this is awesome, but a lot to keep in mind. I generally buy DCC adventures for the maps (its one of the things that drew me to the beta in 2011) and this one is no exception. Their are four pages of Kovacs maps in the back, including a players map of the islands inside the front cover. There is also a section between the two main islands in which the author encourages Judges to adapt adventures from both Goodman Games or third party publishers and makes suggestions as to what may work and how to adapt them to the environment. This may be made easier for those folks who were in on the 4th printing kickstarter and got a pile of adventures along with the core rule book. 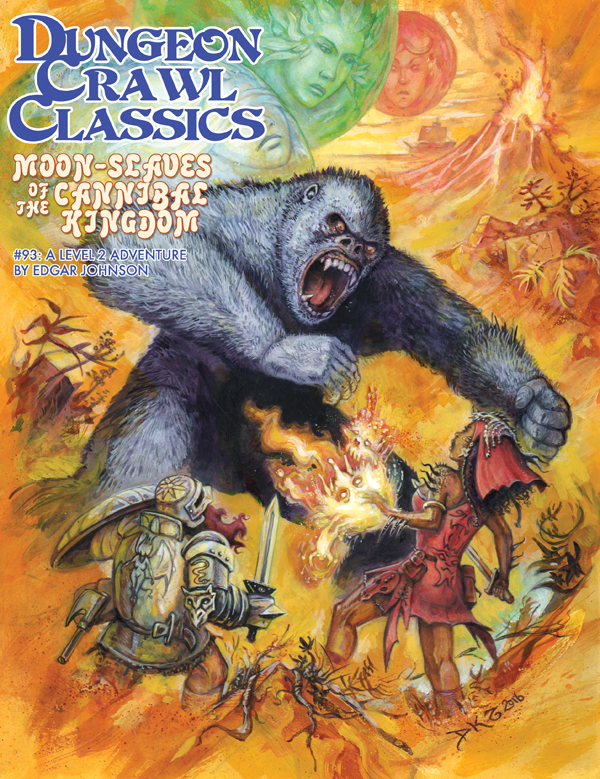 Overall, it is great to see the DCC line still coming out with excellent adventures while expanding offerings into upcoming Mutant Crawl Classics and Lankhmar lines. If you are up to the challenge, set sail for the Tolomak islands! Watch out for cannibals. 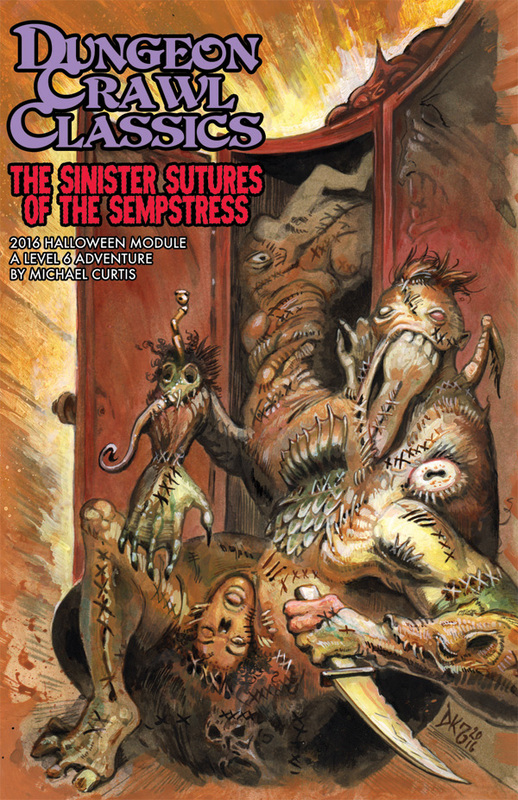 Starting today, we’re going to showcase a monthly “Creature Feature” the last Friday of every month for use in Dungeon Crawl Classics / Mutant Crawl Classics or any OSR-type game. First up: The fearsome Staguar! Staguar (1, rarely travels in pack of 2-4 adults plus 3 to 4 juveniles): Init +3; Atk gore +6 melee (1d6+2) or claw +4 melee (1d4) or bite +4 melee (1d6); AC 16; HD 3d8+2; MV 50’, climb 20’; Act 2d20; SP stealth, bugle; SV Fort +1, Ref +3, Will +7 AL C.
Is this another mad design of noted teratologist Xultich? Only the most learned of sages could say with any certainty. What is known is that the staguar is a fierce predator, stalking and killing their prey to take back to their lairs. The shape of the typical staguar male is that of a great stag with a mighty rack of horns it uses to gore it’s opponents. Instead of hooves, the long legs end in claws and it’s face has the feline predatory mien of it’s jaguar ancestors. The female staguar have less pronounced horns and juveniles almost none at all, with a corresponding dice chain reduction for that attack. Their coloration is typically spotted, but rumors persist of a more tawny colored “Stuma” in mountainous regions or the larger and more ferocious “Stiger” deep in the jungles. A fearsome hunter equally at home in plains and forests, the staguar is an implacable predator able to leap from hiding to bring down creatures many times it’s size due to it’s strong jaws and raking claws. Staguars are quite good at stalking their prey. They receive a +8 bonus to sneaking silently and hiding in shadows. The potentially sorcerous origin of the staguar has manifested in a peculiar way. The combination of jaguar’s roar and stag’s bugle has given the staguar the ability to strike fear into anyone who hears it. When threatened, the staguar can let loose a cacophonous bugling that scares off an attacker or rival. 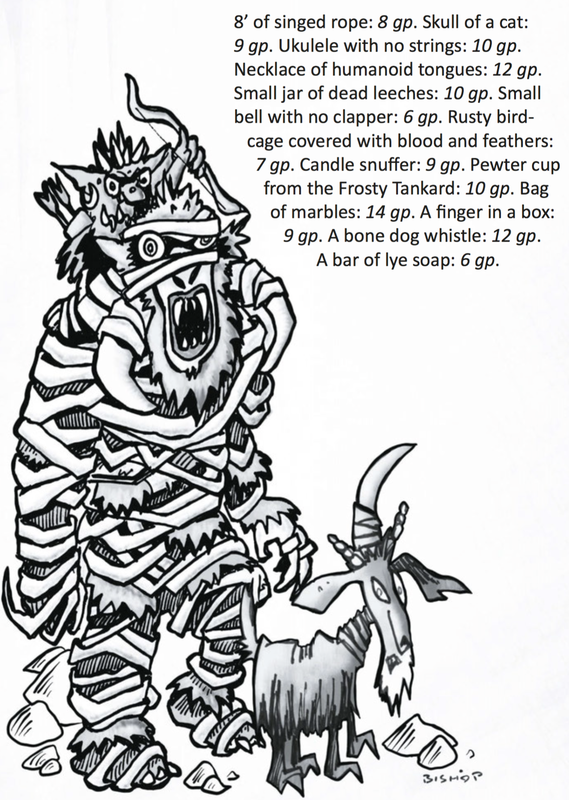 This is treated as the Scare spell cast at +8 on a d16 (see page 191 of the DCCRPG Rulebook). This ability is only present in the male of the species and during the rut season (usually the late autumn) the calls and challenges of adolescent males can make an area almost uninhabitable or gain the reputation for being haunted. March 4th! GMs Day! Mace West Preview! Happy GM’s day gamers! RPGnow is having a big sale, and many awesome publishers are participating. Get yourself or your favorite GameMaster something cool! I’m celebrating GM’s day by preparing for the games I’m running at an upcoming convention: MACE West 2017! This will be the third year the event will be held in Asheville, NC just outside the Biltmore at the Doubletree hotel, March 24-26th. The first year I attended I had a great time, and each year it keeps getting better and better! This year there are a staggering number of board games, RPGs, and other events listed this year at the OGRe. The Skyland Games guys alone will be running Dungeon Crawl Classics, Mutant Crawl Classics, Age of Rebellion, Metamorphosis Alpha, Apes Victorious and Imperial Assault. Games are filling up fast, and we are looking forward to another great year at our “home” convention! Kevin is running the Frost Fang Expedition, a 3rd party published DCC adventure that is almost purpose-built for cons since there is a ticking-clock element to the adventure. The full review is here, but the short version is this: if the heroes don’t succeed, rocks fall and everyone dies. Not everyone in the party, everyone in the town below the crumbling, floating castle. That old chestnut. He is also running one of the Metamorphosis Alpha adventures from the recent Epsilon City kickstarter, and a homebrewed Star Wars adventure called Rogue Two, in which a small rebel commando team is sent to Mytus VII, star’s end, to break out a group of rebel pilots including Wedge Antilles to aid in the assault on the Death Star. Mike is running a homebrewed Mutant Crawl Classics adventure he will also be running at GenCon, but MACE West gets it first! 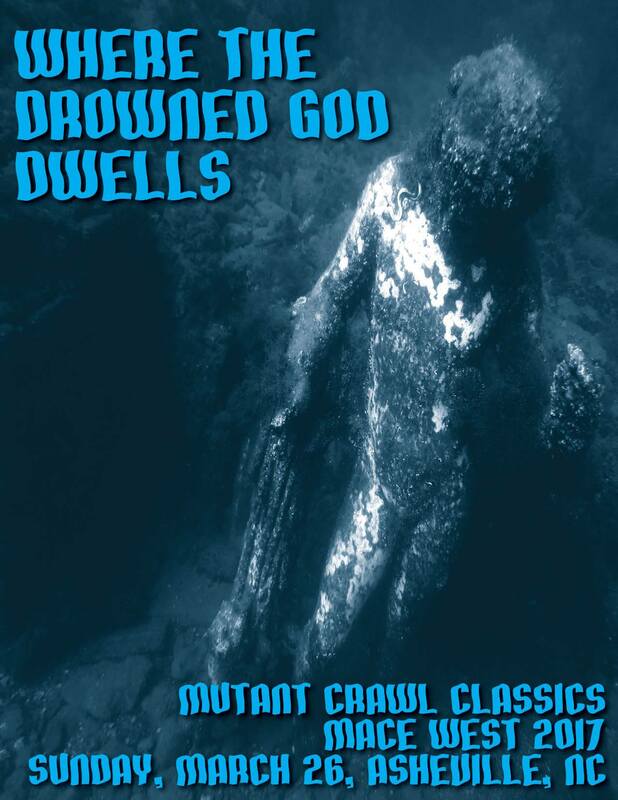 Where the drowned god dwells looks to be an exciting post-apocalyptic underwater adventure! Apes Victorious from Goblinoid Games is based around Planet of the Apes and looks to be quite the enjoyable romp if you’ve ever wanted to play the role of a 70s astronaut marooned on future earth. This one is also on sale as part of the GM’s day event. If you haven’t played it yet, you can try out Goodman Games Lankhmar with Mike running Masks of Lankhmar, an adventure he was fortunate enough to playtest with the author Michael Curtis at GaryCon VII. Scott is running three slots of Imperial Assault, and thanks to the hard work and excellent skill of local mini-painter Galen, they will be some great looking sessions! Minis in the front are some of the bones from recent kickstarters, but the back shelves are all Star Wars! There are more games and events than ever before, these are just the few events we are running. Check out the event pages on facebook and at Justus Productions to find out more. See you there! The 2016 Halloween modules from Goodman Games has arrived and it is awesome! We will get in to some minor spoilers, so this review is geared towards judges looking for something to run either in the coming weeks, or any time you want to run something in the horror genre. This adventure is decidedly creepy with a nice insanity mechanic appropriately termed “unraveling”. This is your final warning, players look away! You will suffer dire corruption if you don’t close this page now! Just us judges? OK – Michael Curtis did an amazing job with this adventure. This one starts with a theme about closets/wardrobes/drawers acting as portals between worlds, and has the party (who may be in the same place, or entirely different planes) called to the pocket dimension of the House of Tattered Remnants, home and prison of the Sempstress. It is digest-sized and weighs in at 20 pages, so is perfect for a convention slot, or one-shot for the holiday. The Sempstress was banished to this pocket dimension ages ago by ancestors of the party. She sent her minions through the various seemly mundane closets or wardrobes to exact revenge on the heroes for her imprisonment. The PCs give chase and emerge in the House of Tattered Remnants. This horror house is filled with creepy challenges and mood-setting details. One of my favorite features of this adventure is the unraveling mechanic. Each PC starts with a stability score equal to their personality stat. If the PCs see something mindbogglingly horrific, they make a DC 10 Will save. On a fail, they lose a point of stability. Once it drops below 10, PCs start manifesting physical signs of unraveling which acts similar to corruption for wizards. Most of them aren’t debilitating, but represent the character losing grip on reality in this twisted pocket dimension. There are a nice mix of encounters and traps, and the gore level is just right for my tastes: present, but not over-the-top. Another excellent feature in this adventure is a nod to classic haunted houses. Clever PCs will search for an artifact that was discarded in vats of spare body parts the Sempstress uses to create her minions. Prepared judges can blind fold a player and physically have them search in bowls peeled grapes as eyeballs and peeled tomatoes as hearts, etc. to find the representation of the artifact in real life. Such a great idea! The final battle with the sempstress herself looks to be quite challenging, even for the 6th level PCs recommended for the adventure. She will likely have a pair of Reality Tailor allies that cast spells using set numbers rather than rolling a spell check result. Those numbers descend over subsequent rounds, but between unraveling checks from the Sempstress and her ability to stitch heroes to themselves or stitch her own wounds, this will be a boss battle to remember! I may just print out a few 6th level pre-gens for ScareFest this weekend. It seems like the perfect venue for this spooky adventure! If you’ve got a seasonally appropriate game night coming up and are looking for a memorable adventure, head to the House of Tattered Remnants. Just don’t become unraveled! 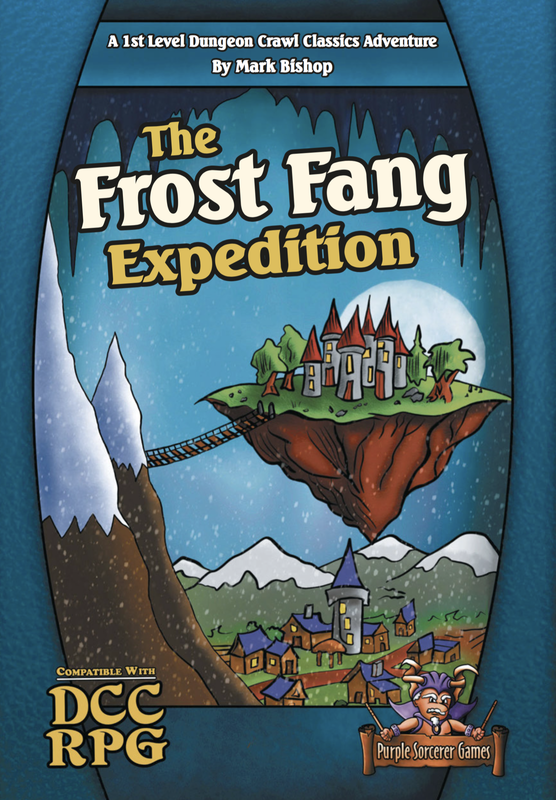 The Frost Fang Expedition by Mark Bishop has been released by Purple Sorcerer games for Dungeon Crawl Classics. This beast of a 1st-level adventure weighs in at a digest-sized 72 pages plus a 40-page full-sized digital appendix for printing handouts, maps, minis, and rumors. Also included in the appendix are great tips for judging the adventure in general, as well as ways to fit this into a four-hour convention slot. The premise is to save the town from a floating earth mote that has been the residence of a reclusive wizard for about 100 years. Recently, lights have started going out in the castle and chunks of earth have fallen into town. 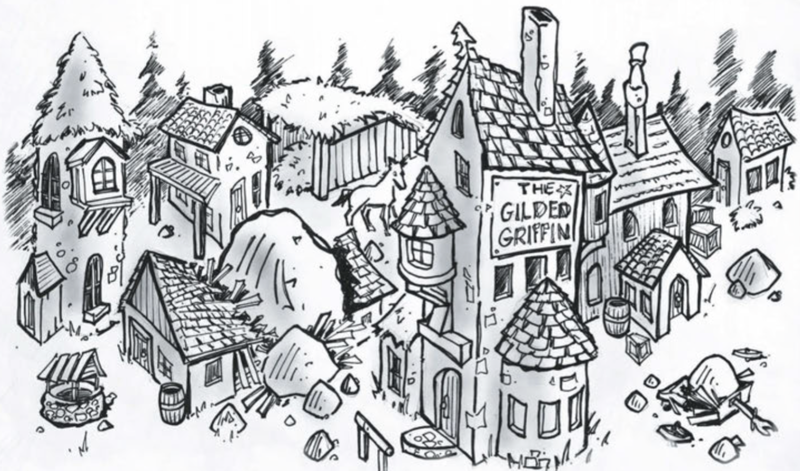 The townspeople fear the magic is fading and need brave adventures to summit the peak, cross the rickety bridge, and avert the impending disaster. This adventure features lots of background information on the town, NPCs, and baddies that inhabit the different locations. Providing this level of detail allows the well-prepared judge to bring the setting and the scenes to life. That being said, I wouldn’t recommend this adventure to a novice judge. If you have about a dozen tables under your belt, you can probably handle the amount of juggling required to keep the adventure running smoothly. T here are two NPCs traveling with the party that want the mission to get to the end goal for very different reasons. This allows a clever judge to use them to drop key hints to the party should they be stuck, but in several scenes will require these NPCs to argue in front of the party about what to do (allowing the PCs to decide the ultimate course of action). This is a really cool device, but may be tough for new judges. The Frost Fang Expedition also has branching paths within the adventure on the way to the peak. This allows for some replay (and certainly re-run) value as the adventures will have some agency in deciding how they want to approach the summit of the mountain. That being said, the encounters are numbered a bit confusingly. Everything throughout the entire adventure is 1-something, like the typical 1-1, 1-2, 1-3 for denoting sequential encounters in certain areas. I would have liked to see the mountain broken up in to different sections, with the branches named with numbers and letters. For instance, at the end of encounter 1-1, the party must choose the left path or the right path. the left path leads to encounter 1-2A and the right leads to encounter 1-2B. both end up and encounter 1-3. Instead, the lettered encounters represent sub-rooms in a particular location. This makes the order of events and following the path of the adventure for the judge a bit more difficult. The overall tone of the adventure is fairly lighthearted despite the impending doom of the town, should the adventurers fail. The illustrations (many by the author himself) are similar in style and tone to the Flaming Deathpits of the Minotaur Mage: Descent into Doomfire (which if you haven’t played, you really should). The final encounter includes quite a bit of juggling (as mentioned in the included appendix) and may be a lot to handle. While there are some simplified spell-duel rules included, I would leave that out for all but the most experienced judges. There will already be a ritual to perform, plenty of NPCs and baddies to run, and a d6 counting down. Currently on sale for $9.99 for Print+PDF, this is an awesome gaming value for some very memorable encounters. I would highly encourage experienced judges to take this one on for a con, and for home campaigns, stretch it out to two or three sessions! There is certainly a lot of good times to be had on the Frost Fang Expedition! Fall is here! That means that AVLscarefest is only about a month away. Last year was a really fantastic time, and the organizers are going out of their way to apply feedback and make this year truly fantastic! 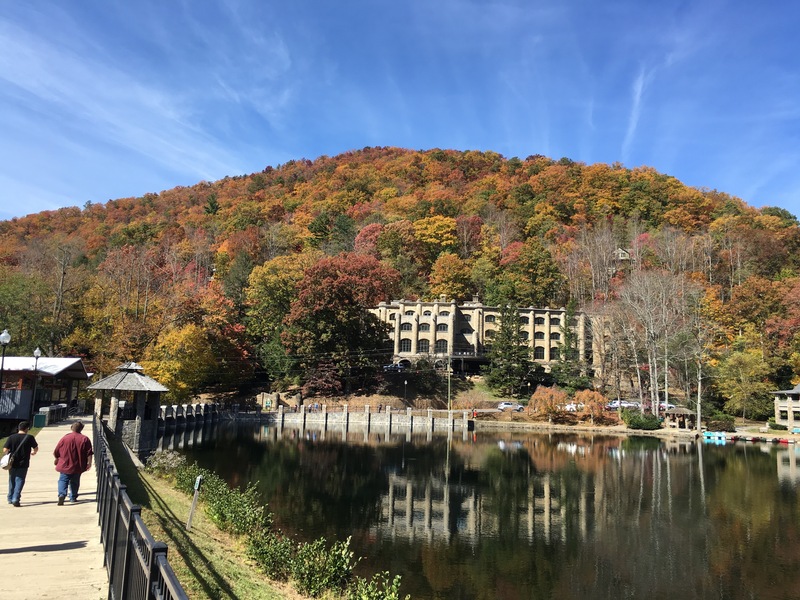 From October 21-23 add set in the picturesque mountains of Montreat, NC, the old stone buildings of the campus and convention center set the mood for some spooky games of all types. Beyond the truly staggering amount of Pathfinder Society games, you’ll find thematically appropriate games of Call of Cthulhu, Dread, Ghostbusters, D&D adventurer’s league, Dungeon Crawl Classics, Lankhmar, Cryptworld, Savage Kingdoms, Bolt Action, and many more! Get your ticket and sign up for games at the warhorn. Last year I had an absolute blast trying games I had never tried before like Deadlands Noir, Bolt Action, and Shadowrun. I also ran a pretty creepy table of Star Wars which became the impetus to get the Star Wars bounty hunter game going. This year I’ll be running Masks of Lankhmar and two sessions of Star Wars bounty hunters. Mike will be running the Shambling Un-dead and the Arwich Grinder! New this year is a token system, in which players and GMs are all provided tokens that can be used to reward awesome role-playing, helping out around the con, and can be used at the end of the con to win some awesome prizes from local vendors. This encourages both excellent games and excellent community spirit. I can’t wait to see the results! Don’t miss out on this fantastic con in the mountains. Try a game you have never played, or bring your favorite game to run. I’ll see you there! Coming back from NTRPG Con loaded with goodies, I started going through things I hadn’t read yet and putting stuff in order. Glad I looked, because I discovered a lost treasure! When I was putting stuff into the zine boxes, I found a great level 2 adventure for DCC RPG called “The Vertical Halls” from Phlogiston Books and written by Gabriel García-Soto that for some stupid reason I never got around to reading before this weekend. Spoiler Alert: It’s pretty damn epic. I loved it from beginning to end. The interior art by Francisco Tebár and Valentí Posa is especially great. I don’t want to spoil anything too much, but there is a lot to work with here. The adventure can literally fit into any kind of scenario. For your ‘typical’ fantasy campaign, you can place it as is into any mountainous region. It could really work well in a Shudder Mountain campaign for sure. You could crank up the weirdness factor and put it into something like the Purple Planet, too! Make the town a ruin an go Crawling Under A Broken Moon. It could fit almost any setting if you do just a little adjusting, I’m sure. It starts out simple enough: your adventuring group enters the town of Shadypass where, like they do, the villagers are all acting a little odd. Some investigation leads you to the main event and I’ve yet to see a creepier or more disturbing setting. Excellent throwbacks to some Lovecraftian goodness and the best part is that the author has taken some ‘typical’ monsters and put their own spin onto them. Great stuff! I can’t wait to get a party inside and make them squirm! The PDF and Softcover combo are available on RPG Now. Definitely one to pick up and I am anxiously awaiting the next product this studio will be releasing!